This topic describes how to configure an Internet Information Services (IIS) web server to support web publishing and deployment using the IIS Web Deployment Tool (Web Deploy) Remote Agent Service. Is the Web Deploy Remote Agent the Right Approach for You? Development or test environments, where the developer has full control over the destination web server and database server. Smaller organizations in which a single user or a small group of users has control over the entire application lifecycle. In lots of larger organizations, and particularly for staging or production environments, it's often not realistic to give users administrator rights on web servers. In the case of hosted web servers, this is especially unlikely to be the case. In addition, if you're planning to automate deployment from a build server, you may not want to use administrator credentials for the deployment process. In these scenarios, configuring your web servers to support deployment using the Web Deploy Handler may provide a more satisfactory choice. Ensure that the Web Deployment Agent Service is running. For more information on joining computers to a domain, see Joining Computers to the Domain and Logging On. For more information on configuring static IP addresses, see Configure a Static IP Address. The Remote Agent service is supported by IIS 6 onwards and does not require you to be joined to a domain. 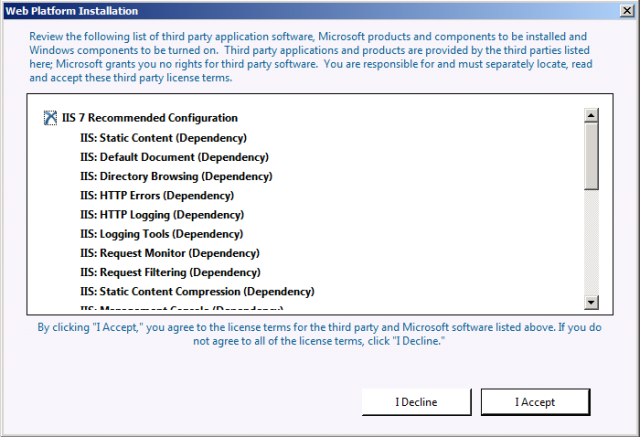 However, the steps in this tutorial were developed and tested on IIS 7.5 and procedures for other versions may vary. Web Deployment Tool 2.1 or later. This installs Web Deploy (and its underlying executable, MSDeploy.exe) on your server. As part of this process, it installs and starts the Web Deployment Agent Service. This service lets you deploy web packages from a remote computer. This walkthrough describes the use of the Web Platform Installer to install and configure the required components. Although you don't have to use the Web Platform Installer, it simplifies the installation process by automatically detecting dependencies and ensuring that you always get the latest product versions. 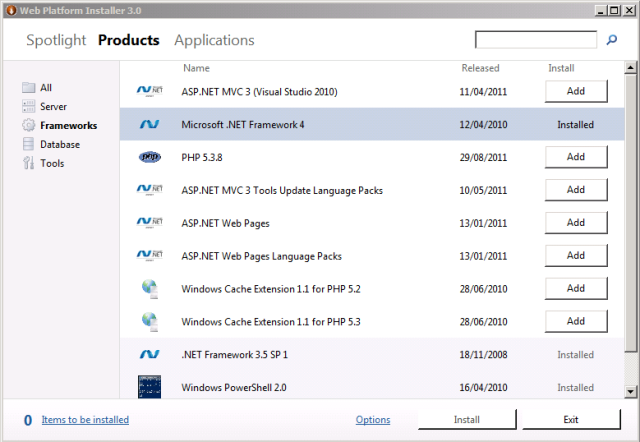 For more information, see Microsoft Web Platform Installer 3.0. If you installed the .NET Framework 4.0 before you installed IIS, you'll need to run the ASP.NET IIS Registration Tool (aspnet_regiis.exe) to register the latest version of ASP.NET with IIS. If you don't do this, you'll find that IIS will serve static content (like HTML files) without any problems, but it will return HTTP Error 404.0 – Not Found when you attempt to browse to ASP.NET content. 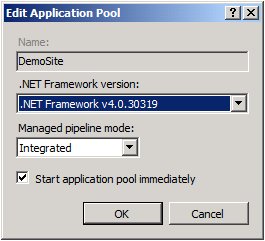 You can use this procedure to ensure that ASP.NET 4.0 is registered. 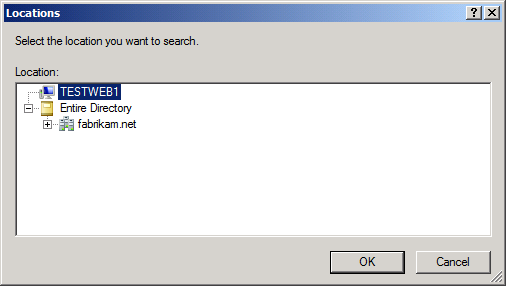 In IIS Manager, in the Connections pane, expand the server node (for example, TESTWEB1). In the Host name box, type the name of your web server (for example, TESTWEB1), and then click OK. The first site binding allows you to access the site locally using the IP address and port or http://localhost:85. 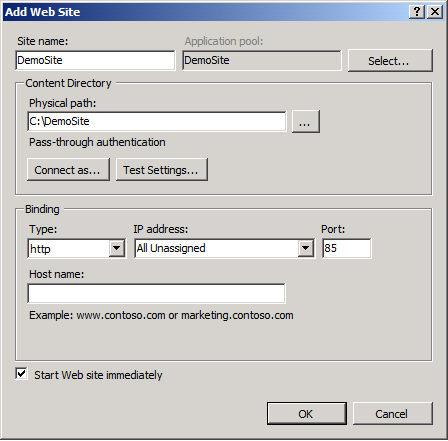 The second site binding allows you to access the site from other computers on the domain using the machine name (for example, http://testweb1:85). The most common approach is to assign permissions to the local IIS_IUSRS group because this approach lets you change application pools without reconfiguring file system permissions. The next procedure uses this group-based approach. In the Permissions for[folder name]dialog box, notice that the new group has been assigned the Read & execute, List folder contents, and Read permissions by default. Leave this unchanged and click OK.
As a final task before you attempt to deploy any web packages to your server, you should ensure that the Web Deployment Agent Service is running. When you deploy a package from a remote computer, the Web Deployment Agent Service is responsible for extracting and installing the contents of the package. The service is started by default when you install the Web Deployment Tool and runs under the Network Service identity. You can check whether a service is running in multiple different ways, using various command-line utilities or Windows PowerShell cmdlets. This procedure describes a straightforward UI-based approach. Locate the Web Deployment Agent Service row, and verify that the Status is set to Started. If the service is not already started, click Start. In most cases, you won't need to configure any additional firewall rules for the Remote Agent Service because web servers typically listen for HTTP requests on port 80. If you customized your installation to listen on a nonstandard port, you'll need to configure firewall exceptions as required. Is the Web Deployment Agent Service running? For guidance on how to configure custom Microsoft Build Engine (MSBuild) project files to deploy web packages to the Remote Agent Service, see Configuring Deployment Properties for a Target Environment.